An active galaxy is a galaxy that has a very small core of extremely high powered emissions emanating from the center of the galaxy. The core is very bright and may be highly variable compared to the rest of the galaxy. Some active galaxies have jets emanating from two sides of the center. It is believed that almost all galaxies have super-massive black holes at their centers. "Active" galaxies have an Active Galactic Nucleus (AGN) and are often referred to as "AGN" galaxies. But, not all galaxies have an "active" super-massive black hole. For example, the black hole in our Milky Way Galaxy is not active. To be active, the galaxy must have a source of gas, dust, and/or other debris that the super-massive black hole can readily consume. As a galaxy ages, its black hole eventually runs out of local consumable materials and the black hole becomes "dormant" (but not dead). If a fresh supply of material is devoured, a dormant super-massive black hole can begin to emit high powered jets again. This happens from time to time when two galaxies collide, or a star or nebula (cloud of gas) gets pulled into the gravity domain of a super-massive black hole. 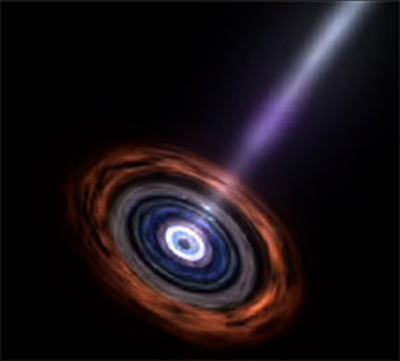 There is an accretion disk around the black hole which accelerates the materials to close to light speed and some of the material is ejected out of the disk in the form of jets. Pictured to the left above is Messier 87 (M87 for short or NGC 4486) a very active "radio" galaxy in the Virgo Cluster. The small white round circle in the center is the super-massive black hole. This image is a composite from NASA's Chandra X-ray Observatory (x-rays in blue) and the National Science Foundation's Very Large Array (VLA) radio observations in red. In this image, cold gas matter from the cluster is falling towards the core of M87, where it's met by the near light speed jet, producing shock waves in the galaxy's nearby interstellar medium. 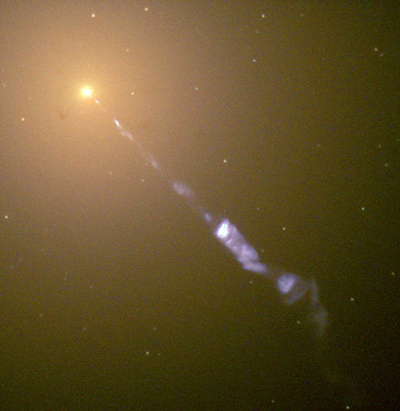 Also to the left, is a normal light view of M87 from the Hubble Space Telescope. The super long jet is 5,000 light years in length! The yellow ball is the AGN center, whereas the long blue jet is synchrotron radiation. Synchrotron radiation originates from collisions of electrons and positrons circulating at extremely high speeds around the lines of a strong, twisting and growing magnetic field. All AGN galaxies exhibit the same basic processes. Namely, a super-massive "active" black hole at the center and an accretion disk around the black hole. They all have a bright central core fed by local gas and/or a nearby star. They differ mainly in intensity of input. The more intense the galactic center, the higher the radiation energy it emits. The radiation emitted varies from radio and infrared waves to x-rays and gamma-rays. While it is still not fully understood "exactly" how jets are formed, most astro-physicists believe the jet's power comes from the accretion disc. 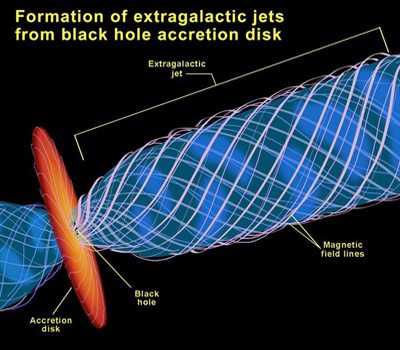 Accretion discs around some other stellar objects are able to produce jets, but the jets around black holes are by far the most active and approach the speed of light. This is because the speed of the jet is about the same speed as the escape velocity from the accretion disk. This makes the speed of a jet from a black hole disk near the speed of light, while jets from newly born stars are much slower. When matter is ejected at speeds approaching the speed of light, these jets are called "relativistic" jets. The most popular jet formation hypothesis is that the twisting of magnetic fields in the accretion disk collimates the outflow of plasma along the rotating axis of the black hole so that jets emerge from each face of the disk. See the artist's conception at the left. Extremely hot matter has been observed just a few milliseconds before it plunges into the oblivion of a black hole by the European Space Agency’s (ESA's) Integral Gamma-ray Observatory. This study revealed that thehigh speed twisting magnetic fields form an escape tunnel at near the speed of light for some of the high energy plasma. The electromagnetic radiation emitted when charged particles are accelerated "radially" is called "synchrotron" radiation. This results from electrons revolving very fast through intense magnetic fields. See the close up jet schematic at the left. Synchrotron radiation can also be produced here on earth by using bending magnets in synchrotrons, hence the name. The radiation produced in this way has a unique characteristic polarization that can be detected by astro-physicists. 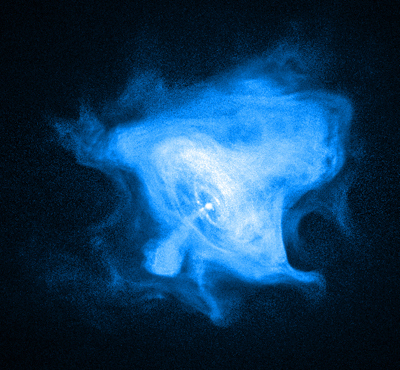 The blue glow of the Crab Nebula Center to the left below is synchrotron radiation detected by the Chandra x-ray space telescope. One can see a very nice actual picture of the central black hole, the accretion disk and the jets in this fabulous image. This Crab Nebula image is 10 light years across. Just a few hundred miles from the deadly event horizon, the space is a violent storm of hot particles and radiation. Vast amounts of particles are falling to their doom close to the speed of light raising the surrounding temperatures to millions of degrees. Ordinarily it takes just a millisecond for these particles to cross the final horizon, but astronomers now know that this chaotic region is threaded by magnetic fields that provide some particles and radiation a way out. Ordinarily it takes just a millisecond for these particles to cross the final horizon, but astronomers now know that this chaotic region is threaded by magnetic fields that provide some particles and radiation a way out. The composition of the jets is a matter of much debate in the scientific community. It is hypothesized that the jets are composed of an overall electrically neutral mixture of electrons, positrons, and protons. The evidence points to the magnetic fields being so strong as to tear away particles from the black hole’s gravitational pull and funnel them outwards. Thus, jets of matter with spiral trajectories are created that shoot hundreds of thousands of light years into outer space. As the quality of high-energy light observations has improved over the past few years, evidence has mounted showing that photons are being created in a very hot, sparse region above and below the accretion disk. Called the corona, this violently boiling region around the comparatively cool disk is similar to the corona surrounding our sun. (The sun's corona is responsible for much of the x-ray luminosity seen in its spectrum.) Computer simulations predict that very high temperatures, plus the density and speed of the in-flowing gas, dramatically amplify the magnetic fields threading the disk, which then exert additional pressures on the incoming gas. The result is a turbulent froth orbiting the black hole at speeds approaching the speed of light. X-rays and gamma-rays are produced as the matter swirls into the super- massive black hole. They are ejected at relativistic speeds and are also reflected from the spinning matter before its eventual accretion. All these features illustrate that astronomers are tracking matter to within twice the radius of the black hole itself, which is very, very close by astronomical standards. Radio Galaxies: radio and other wavelengths between 10 MHz and 100 GHz from synchrotron processes, but no gamma rays. Seyfert Galaxies: x-rays and gamma rays up to energies of about 100,000 electron volts (eV) from thermal processes. Blazar Galaxies: jets of energy exiting their black holes are pointed directly towards earth, jets rip across space at up to 99% the speed of light, jets emit very high energy gamma-rays with wavelength intensities that vary dramatically over time. Quasars: most powerful, luminous, energetic objects in the universe, have a very high redshift (meaning quasars are very distant). The spectra of quasars show broad emission lines of gas excited to very high levels. They also exhibit an underlying blue continuous spectrum lacking the absorption lines from ordinary stars. The unified theory (or unified model) of active super-massive black holes was developed in the late 1970s. It was created to explain why some black holes, all similar in structure, can look completely different. Some appear to be shrouded in dust, while others are exposed and easy to see. The unified model proposes that every black hole is surrounded by a doughnut shaped large structure called a torus further outside and around the accretion disk. Depending on how the “doughnuts” are oriented in space relative to the earth, the black holes will take on various appearances. For example, if the doughnut is positioned so that we see it edge-on, the black hole is hidden from view. If the doughnut is observed from above or below, the black hole is clearly visible. See the two sketches to the left. Time is also a factor. The theory says that all super-massive black holes originally started out as Quasars, which are now quite scarce. Over time some run out of food, dust and small particles, and become dormant (our Milky Way black hole is an example). Or, for lack of a robust meal, they just emit less energy and become Radio and Seffert type black holes. The unified theory says that all super-massive black holes are all of the same basic structure, we just see them from different angles and over different periods of time. However, a recent survey of more than 170,000 supermassive black holes, published in 2014, using NASA’s Wide-field Infrared Survey Explorer (WISE), has astronomers re-examining the decades old theory about the varying appearances of these interstellar objects. The WISE results do not completely corroborate the unified theory. The researchers found evidence that something other than a doughnut structure may, in some circumstances, determine whether a black hole is visible or hidden. The team has not yet determined what this may be, but the results suggest the unified, or doughnut, model does not have all the answers. 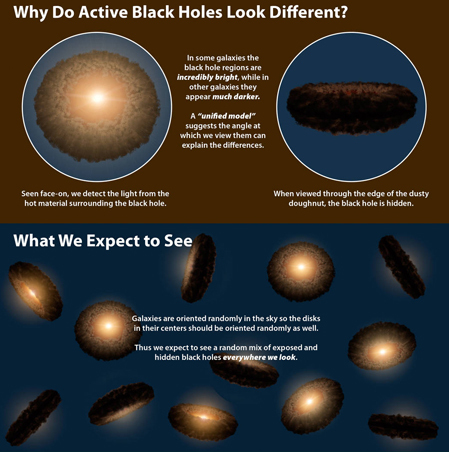 "Observations from WISE reveal that hidden black holes tend to be more clumped together than exposed ones. This violates the "unified model" which predicts we should see the same random distribution of dusty doughnuts regardless of how clumped the objects are" says NASA. "Strongly clumped galaxies are likely to have larger halos of dark matter, which might provide a clue about what else besides the doughnuts could be hiding the black holes." See the clumped galaxies in the image to the left in which dark matter is shown in purple. Radio galaxies are a type of AGN galaxy that are very luminous at radio wavelengths between 10 MHz and 100 GHz. The radio emission is due to the synchrotron process which is inferred from its very smooth, broad-band nature and strong polarization. Synchrotron radiation is not confined to radio wavelengths. If the radio source can accelerate particles to high enough energies, features which are detected in the radio band may also be seen in the infrared, optical, ultraviolet and x-ray bands, but not in gamma-rays. Shown at the left is a composite image of Centaurus A, a nearby "radio" galaxy in the constellation Centaurus. The orange "lobes" are radio emissions, which at their extremes are about one million light years from the central black hole. The blue pixels are from an x-ray image taken by the Chandra spacecraft. The stars and the accretion disk are shown in true colors from a normal light telescope. 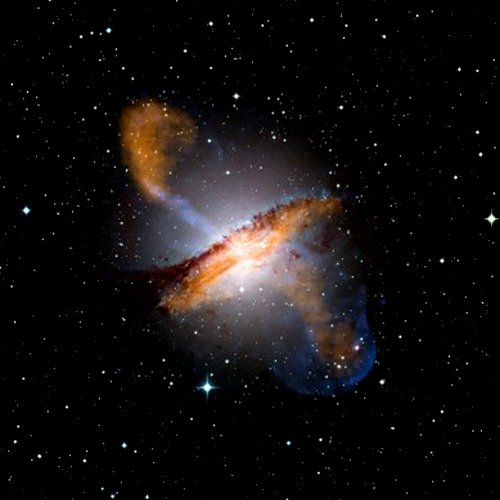 Centaurus A is the nearest galaxy to earth that contains a super-massive black hole "actively" powering a jet. The super-massive black hole has a weight of about 55 million solar masses. Radio galaxies display a wide range of structures surrounding the black hole. The collision of black hole jets with galactic gas and dust creates shock waves that result in visible lobes. These are double, fairly symmetric, roughly elliptical structures at a fair distance on both sides of an accretion disk. (In other radio images, some lower luminosity radio sources have structures called plumes, which are much more elongated and erratic.) 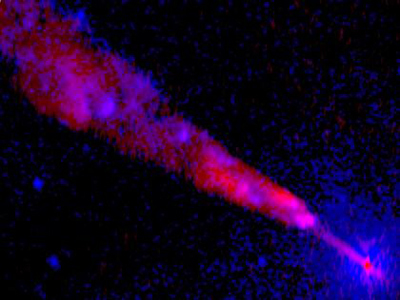 The blue and red image to the left below is a close up view of the above Centaurus A jet showing the inner most 4,000 light years. 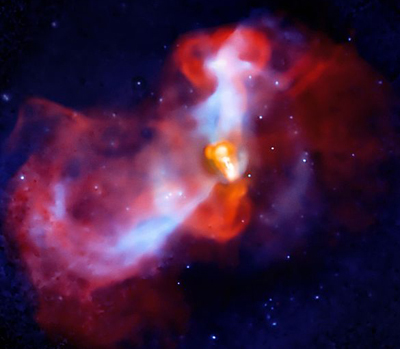 This is a composite image with Chandra x-rays in blue and VLA (Very Large Array) radio observations in red. 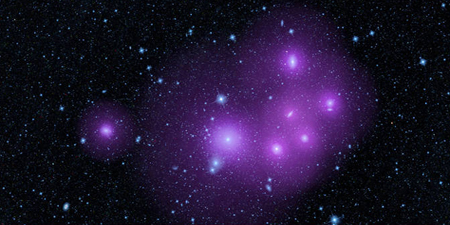 The bright purple regions show both radio waves and x-rays intermixed. The super-massive black hole is at the lower right hand portion of the image. By taking radio observations of the jet separated by a decade of time, astro-physicists have determined that the close-in parts of the jet are moving about one half the speed of light. Most of the X-rays from the jet are produced farther out where the jet slows down as it plows through the outer gas of the galaxy. The x-ray structure of the jet is significantly different than the radio structure. Seyfert Galaxies are a class of galaxies with nuclei that produce low energy gamma-rays. They are named after Carl Keenan Seyfert, the astronomer who first identified the class in 1943. Seyfert galaxies are characterized by extremely bright nuclei and spectra that have bright emission lines of hydrogen, helium, nitrogen, and oxygen. Like other AGN galaxies, scientists believe they have super-massive black hole centers about the size of 100 million solar masses. 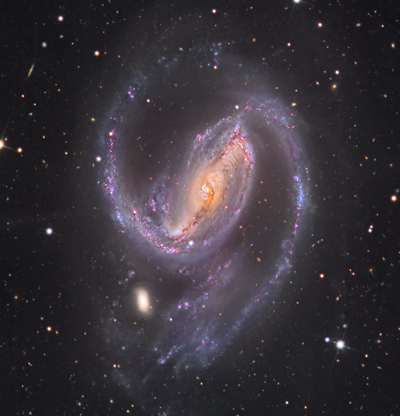 The galaxy at the left is a Seyfert Galaxy, NGC 1097. Its super-massive black hole is gradually absorbing gas and other matter from around it. The distinctive ring around the black hole is bursting with new star formation due to material flowing in towards the black hole. These star forming regions are glowing extremely bright due to emissions from clouds of ionized hydrogen. The bright ring is about 5,000 light years across. The spiral arms are also full of new forming stars. In the radio image at the left, two jets shoot out of the center of active galaxy Cygnus A with large yellow/reddish lobes on either side. When an active galaxy is oriented so that the jets of energy exiting the black hole are pointed directly towards earth, the observations become more dramatic. These objects are called blazars. But blazars are fairly rare among active nuclei, with only about 2,700 known at this time. In a blazar, the emitted light includes very high energy gamma-rays, 100,000+ electron volts, which can be a billion times more energetic than the light we can see. The material in these jets can rip across space at 99% the speed of light. Some jets remain tightly collimated for hundreds of thousands of light years. The light generated by a blazar has other unique properties, such as wavelength intensities that vary dramatically with time. Blazars are extremely variable at all wavelengths, changing both their spectra and total energy output. Their time scales can range from less than an hour to many years. The variability of different wavelengths and their mutual relationships is a crucial test for models attempting to explain these phenomenon and identify the jet particles. At peak emission, observing a blazar feels a little like looking down the barrel of the most powerful gun in the universe. In some cases, the material exiting a blazar appears to be moving faster than the speed of light, but this is an illusion caused by the geometry of a source moving at high speed that is nearly but not perfectly head-on. 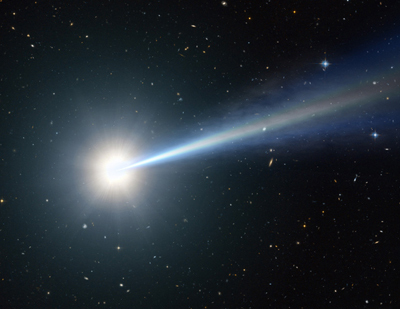 Oldest Blazars Discovered. A trio of Clemson University scientists, led by astrophysicist Marco Ajello, has identified a black hole and four others similar to it that range in age from 1.4 billion to 1.9 billion years old. These objects emit copious gamma rays, light of the highest energy, that are billions of times more energetic than light that is visible to the human eye. The previously known earliest gamma-ray blazars, a type of galaxy whose intense emission is powered by extremely powerful relativistic jets launched by monstrous black holes, were more than 2 billion years old. The Clemson team’s breakthroughs were made possible by recently juiced-up software on NASA’s Fermi Gamma-ray Telescope. The refurbished software significantly boosted the orbiting telescope’s sensitivity to a level that made these latest discoveries possible. Using Fermi data, Ajello and colleagues began with a catalog of 1.4 million quasars, galaxies that harbor active supermassive black holes at their centers. Over the course of a year, they narrowed their search to 1,100 objects. Of these, five were finally determined to be newly discovered gamma-ray blazars that were the farthest away and the youngest ever discovered. Ultimately, through simulations and other data, they confirmed that the five sources were guaranteed to be gamma-ray blazars, with the farthest one being about 1.4 billion years old from the beginning of time. In the 1960s there were observations that there existed stellar objects that emitted radio waves which were thought to be stars that had unusual optical spectra. With the optics available at the time, quasars looked like single points of light indistinguishable from faint stars. Finally it was recognized that the spectra lines had large Doppler shifts suggesting velocities that were fractions of the speed of light (relativistic speeds). These objects were obviously not ordinary stars and were named "Quasi-stellar Radio Sources", meaning "star-like radio sources", which was soon abbreviated to "quasars". Quasars are the most luminous, powerful, and energetic objects in the universe. At the left is a NASA artist's concept of a quasar. AGN galaxies all have a very powerful energy source much bigger than what ordinary stars produce (including supernovas and neutron stars) coming from a small area in the center of their galaxies. Quasars are now recognized as super massive black holes at the center of emerging galaxies "back in the early universe". 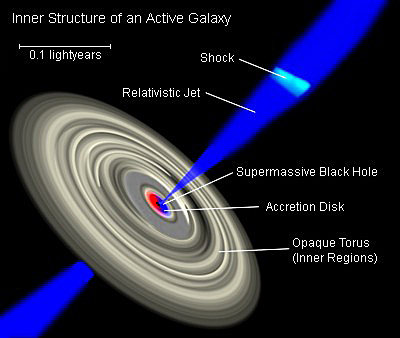 The quasar is believed to be powered by the "accretion disc" around the centralized black hole. A blazar and a quasar are actually the same object, but viewed at different angles from the earth. A quasar, whose jet is pointed less than 10 degrees to the plane of the earth is called a blazar, and a blazar whose jet is pointed more than 10 degrees to the plane of the earth is called a quasar. The difference in the names comes from the fact that blazars are much more luminous than quasars, but this is due to the angle of the jets. When a beam is almost head on to the earth, relativistic effects (effects due to speeds close to the speed of light) make the head on beam appear much brighter and energetic than when beams are pointed into outer space. Most quasar radiation exceeds the luminous output of average size galaxies. However, they appear star-like in ordinary telescopic photographs because the light from their nucleus dominates the light from the surrounding galaxy. .Most quasars are about the same size as our Solar System (relatively small), which implies a humongous energy density, about 2 trillion times the energy of the sun. The typical brightness of a quasar is a luminosity of 10^40 watts. For more info on Quasars go to the Quasar Page.